Even if photography is your dream job and you love it more than anything else, it’s not always easy to stay on task. It can be really easy to put off the more dull parts of working for yourself, and find that hours have passed while you’ve scrolled through Facebook. However you need those little breaks to stop feeling burnt out throughout the day, so here are a few ways to productively procrastinate. If you are a bit of a social media fiend then this task is for you. Take ten minutes out of your day to do a quick browse through social media and to share some new content with your followers. This gives you your social media fix and benefits your business! Take a few minutes to read through a worthwhile blog post and leave a thoughtful comment. You never know, that comment might lead to some more followers or even a collaboration in the future! If you get comments on your blog or social media channels then take a few moments to read through them and reply. I would suggest you do this as regularly as possible because as a client, receiving quick and helpful feedback makes your business awesome! It’s really important for your business that you keep all your company platforms up to date. This includes your website contact page, your social media channels and your email footer. You want to make sure that if a client tries to contact your business they’re being directed to the right place. There’s no easier way of losing someone’s business that making it difficult for them to get in touch. This statement doesn’t mean you should spend seven hours pinning, but taking twenty minutes to pin some high-quality content keeps your boards fresh and your followers interested. This is the time to send out any images you’ve been meaning to share and to heart/comment on anyone you’re following. Make sure you only send out a few images at a time, as sharing thousands of pictures in twenty minutes can be quiet off putting to your followers. Spend ten minutes organising your emails into labelled folders. This will make it easier for you to find what you’re looking for and hopefully make ’email time’ more pleasurable. It only takes a couple of minutes to straighten up your desk, empty the bin and run a cloth over any coffee-stained surfaces. This will make you feel more productive and raring to go and be a much more welcome sight to clients if you’re working from a studio. Take five minutes to tidy up any desktop folders, delete unwanted files and straighten up your Google Drive. Gather up any stray receipts and important papers and make sure you store them in the appropriate areas. This will definitely make you feel purged and more in control of that ever-growing paper pile but also mean you’re on top of things when tax time rolls around. Get yourself prepared for the rest of the day or tomorrow by writing out your to-do list. Take ten minutes to email a past client letting them know of a service or offer you think they might be interested in, or even just to say hi! 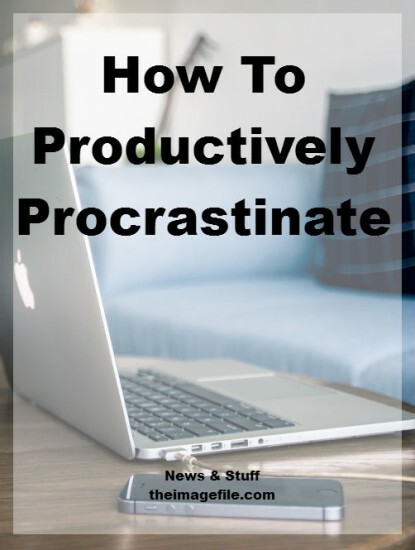 How do you productively procrastinate?